I know that no great story ever starts with "I ate the best salad last night." But salads are an inevitable part of life, and of course, dinner. Sooner or later someone may even ask you to bring one to their house or you may host an event that salad would make for lovely feasting for both herbivores and carnivores alike. Why reach for an everyday bottle of salad dressing when you can impress with a simply delicious Greek Italian homemade blend instead? My husband is Greek Italian and if it works so beautifully on him I figured why not to try to marry the two together in a jar? And if you want to really keep the night going in a deliriously good time instagram-worthy direction, be sure to serve it with another dinner favorite... wine. Don't they look good together? Combine ingredients in a glass jar and shake until well blended. Toss with your favorite vegetables and greens. Enough to make one large group of Greek Italians very happy. Or refrigerate the remaining amount for up to two weeks. Opa! Beautiful and delicious looking...can't wait to try! We like mixing garlic expressions dressing with Italian dry seasoning mix. Just saw this now, Katie...and it looks wonderful. I'm always looking for new homemade dressing recipes! 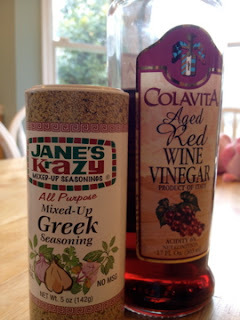 Where do you get the Greek seasoning? Yum!